AP LAWCET and AP PGLCET 2016 results has been declared today by education minster and Sri Krishnadevaraya University.The examination was conducted by Sri Krishnadevaraya University on 28th May.The candidates who appeared the examination can check the deatils on official site www.aplawcet.org . AP LAWCET and AP PGLCET are the Andhra Pradesh Common Law Entrance Tests for admission into LL.B 3/5 Year Law Courses and LL.M Courses in the Universities in Andhra Pradesh and their affiliated colleges. 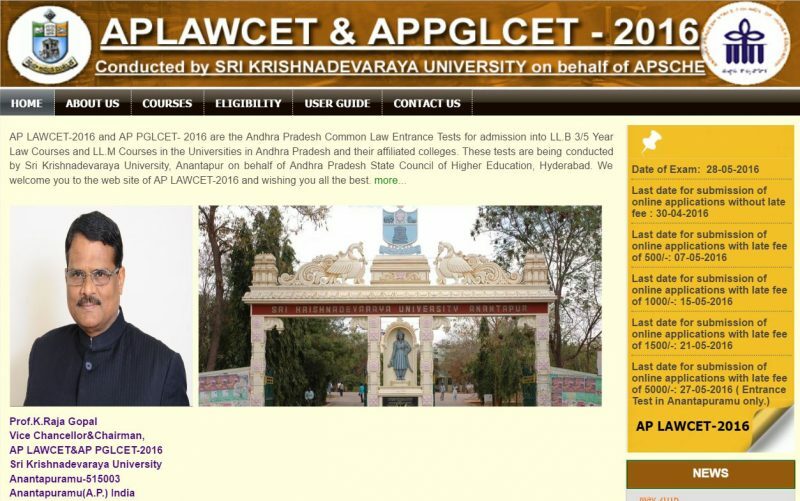 click on AP LAWCET and PGLCET 2016 results. Enter Hall ticket Number and click on submit button. Results will appeard on your screen. save and dwonload Take a copy of print out for furthur usage. Sri Krishnadevaraya University began as a Post-Graduate Centre of Sri Venkateswara University in 1968. The Post Graduate Centre was given Autonomy in 1976 and was elevated to the status of a University in 1981. Initially, the University functioned as a unitary University and was conferred the status of affiliating University in 1987. The University college offers 39 Post Graduate and 3 Under Graduate courses through 29 departments. The University College of Engineering and Technology has been offering B.Tech and M.Tech Programmers in four Engineering branches since 2006-07. The University College of Education offers B.Ed. and M.Ed. courses. The University college also started B.Pharm and M.Pharm courses in 2008-09. Sri Krishnadevaraya University has been contributing to the cause of higher education through 78 affiliated degree colleges, of which five are meant exclusively for women. The other colleges affiliated to the University include 25 colleges of education, one oriental college and one Law College. There are 25 affiliated colleges offering Post – Graduate courses in various disciplines.